This 3-day workshop is a wonderful opportunity to play with color and form. I say “play” because it is one of the most playful workshops I teach. 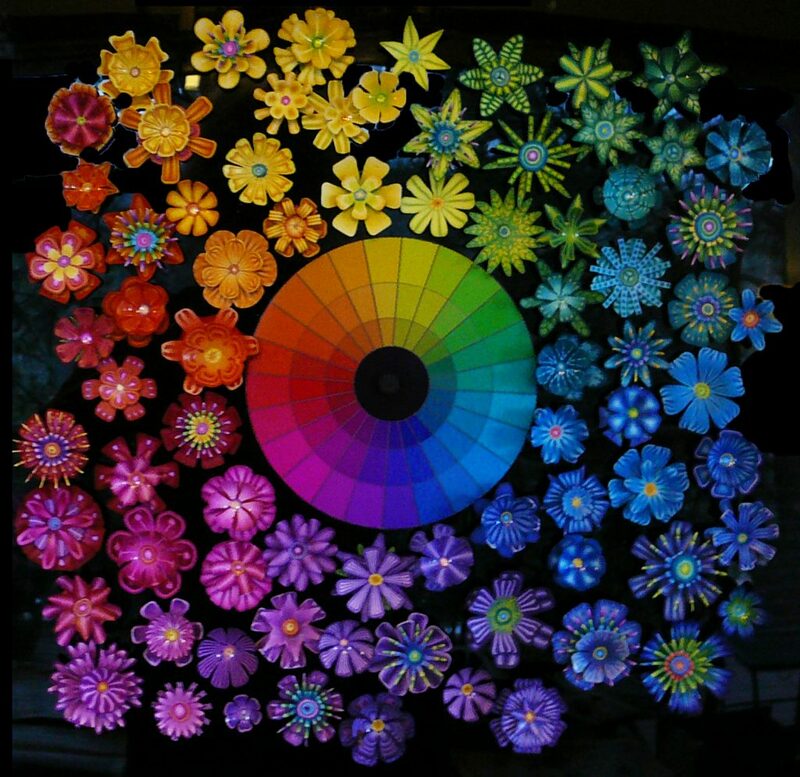 Forget your cares and responsibilities and submerge yourself in the joy of color and the beauty of flowers. Everyone leaves this workshop smiling. 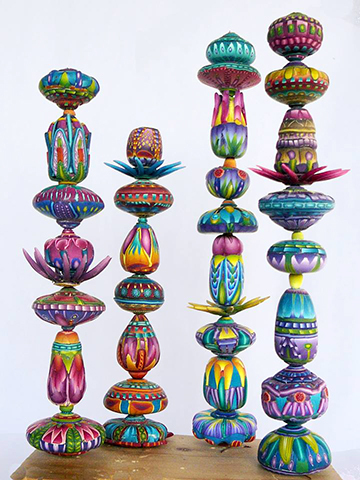 Working from simple canes, you will make 3-dimensional fantasy flowers and colorful totems. 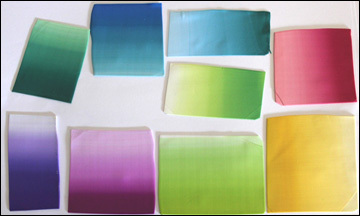 You will begin by making blended sheets of your chosen colors. * These blends will be transformed into several types of canes which will be thinly sliced and used as flower components (petals, leaves,stigmas styles, etc.) and/or decorative elements on totems. Some of the flowers sections from the Houston Guild Workshop. Next I will show you how to combine the components on metal forms and turn them into flower sections (right) by baking them on the forms. The next step is to assemble the flower components on wires to form complex and unusual flowers drawn from nature and your imagination. I will also demonstrate how the same cane slices can be used to make 3-dimensional totems suitable for stacking on a central rod. Totems I made for a swap. 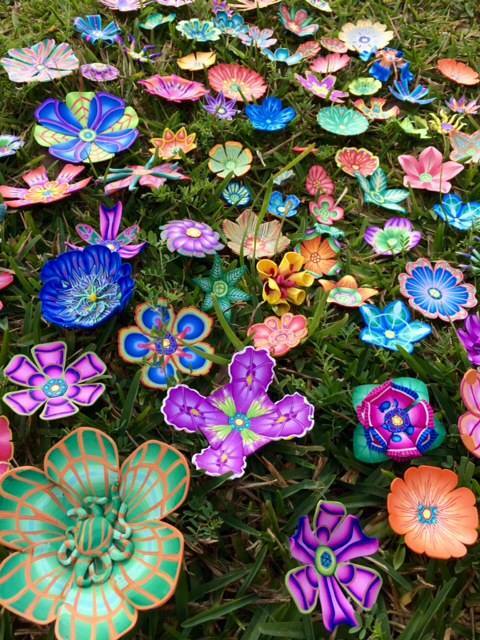 Most students focus on the flowers, but totems are always an option for those who do not want to make flowers. 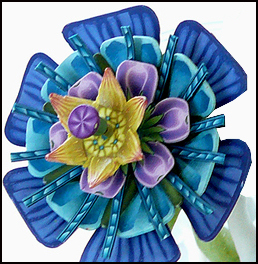 Flowers and totems can even be combined to create more complex sculptures. As an added bonus, there will be lots of leftover cane slices for you to play with at home. This will be a fast-paced workshop with no time to teach basic techniques. Participants should know how to make color blends using a pasta machine and make simple, shaded canes. The rest is easy. Pure fantasy by Marie Curt and Patty Minton Welch.